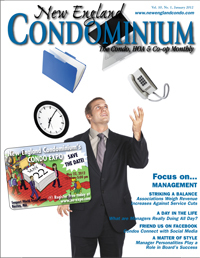 Get Ready for New England Condominium;s 2012 Condo Expo! Where Buildings Meet Services. Brought to you by the publishers of New England Condominium, on May 22nd at the Seaport World Trade Center in Boston, MA, beginning at 10:00 a.m. to 5:00 p.m. is the 2012 Condo Expo. In once day, one location and endless solutions, there will be over 150 exhibitors, thousands of products, educational seminars, peer networking opportunities and free advice booths. Save time and build relationship – Meet with over 150 exhibitors. Register for FREE for the 2012 Condo Expo!